Before this episode began, I was chatting on Facebook with some fellow Walking Dead fans about the potential for the loss of one of the members of the Grimes and Company group. We had our theories, some of which would have been devastating to loyal viewers and some which, though disturbing, would have been, at the very least, understandable. Someone did die, an important somebody, and that death is going to change the way the other characters will go forward. Rick is a man on a mission, having fashioned a prisoner swap of sorts, hoping to trade two of Deputy Dawn’s people in return for Carol and Beth. There would have been three deputies to barter with, but Bob failed to heed Rick’s warning to stop and Rick was forced to run him over, then shoot him before the walkers got to him. At least he showed that much mercy. He did tell Bob to shut up, though, so,maybe he just couldn’t take the guy’s caterwauling. This episode showed us that Father Gabriel is more useless and inept than even the cowardly, lying, mullet wearing Eugene when it comes to survival techniques in a world of walkers. Having broken out of his own church, with no apparent plan beyond that, he stepped on a nail and limped around the woods, drawing walkers back to the church, putting himself, Michonne, Carl and baby Judith in danger. All of them managed to make it out alive and were greeted by the bus carrying Abraham, Rosita, Tara, Glenn, Maggie and a barely there Eugene. When Maggie is told that Beth is alive, the group heads to Atlanta to help the others. Rick, in the meantime, has spelled out his plan to two of Dawn’s deputies, while Sasha and Daryl give him cover from a rooftop. The captured deputies have agreed to lie about Bob’s demise and are willing to say that he was overtaken by “rotters”. All should go according to plan, right? Well, not so fast, because nobody has asked Dawn about her thoughts on the matter. Dawn has been busy fighting with the brutal Deputy Moron, and before he can kill his boss, Beth comes to the rescue and manages to push him down the elevator shaft where a passel of walkers are waiting for their afternoon snack. Dawn seems to be grateful to Beth for saving her life, but Dawn is a prickly sort of gal, so don’t start counting your chickens just yet. Finally. Rick and his crew, come face to face with Dawn and hers. The captured deputies tell he the story about Bob meeting his death at the jaws of the “rotters” just as they said they would, and things are looking good. Dawn tell Rick that it will be one her for one of his, and Carol trades places with one of the deputies. Then it’s Beth’s turn to walk back to her own group, and she and the second deputy pass each other in the hall. So far, so good. But Dawn couldn’t leave it at just that. She demands that Noah return to the hospital group. something that was never a part of the deal. Rick is understandably angry, and tells Dawn that it isn’t going to happen that way. Dawn isn’t concerned with what Rick has to say, and insists that Noah has to stay behind or this isn’t going to end well. Noah steps forward and tells Rick that he’s willing to stay behind if it means that Beth and the others will be safe. Beth, after hugging Noah, turns to Dawn and says that she finally gets it. Beth then slips the pair of scissors she’s hidden under her cast and stabs Dawn in the chest. Dawn fires her gun, possibly unknowingly as she was dying from her wound, shooting Beth in the head, killing her. While Rick’s group looks on, stunned by the scene, Daryl shoots Dawn in the head. Another female deputy tells her fellow officers to stand down and Rick tells the hospital group that anyone who wishes to leave is welcome to join them. Rick and the others exit the hospital and are met by the rest of the group. Maggie’s face turns from joy to utter devastation when she sees that her younger sister’s lifeless body is being carried out in Daryl’s arms. Maggie is now the sole surviving member of the Green family and moral compasses are becoming harder to come by. The last thing we see is Morgan, whom we haven’t seen since Carol turned Terminus into a smoldering pile of rubble. When Rick last saw Morgan, the guy was in tough shape, emotionally and physically, and it’s yet to be seen if he’s gotten any better. He’s in the area of the school that Father Gabriel had visited earlier. He finds a walker and shushes her before stabbing her in the ear. He then moves on to the church and steps inside. He places some items on the altar including a lucky rabbit’s foot, a bullet and a package of Goo-Goo snacks. He finds the map with Abraham’s message to Rick. If Morgan is looking for Rick, that map isn’t going to help him anymore. 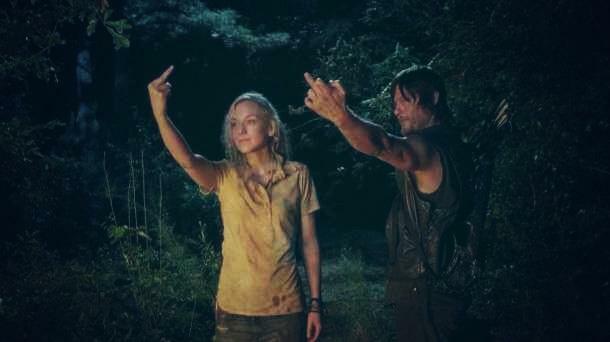 This entry was posted in Walking Dead and tagged AMC, Beth, Carol, Daryl, Glenn, Maggie, Rick, The Walking Dead. Bookmark the permalink. Great recap. I was relieved that, if a main character had to go, it was Beth. The actress who played Beth was a guest on the Talking Dead and she was very emotional talking about leaving the show. She tried not to cry, but she broke down several times. She said she has had an apartment in Georgia for three or four years now and has become friends with the cast members, really close friends with several of them. She says she found out she was going to be killed off after filming the next to the last episode so she was really busy getting ready to move while trying to prepare herself for the last episode. They also discussed how things might have turned out differently if Shane had lived instead of Rick. Rick has evolved into what Shane was in the beginning. No second chances from Rick anymore, as evidenced by what he did with Bob the cop. The producer said the group would have been much smaller had Shane lived instead of Rick because Shane was more apt to sacrifice someone than Rick is. Anyway, the producer (can’t recall his name but I should know it) said the show is going in an entirely different direction now. By the way, the producer said that Daryl is “straight” so the rumors that Daryl may be gay can be put to rest. Great recap! I was so hopeful that all of Rick’s group would survive. Poor Beth! I’ll miss her. I thought that the group would reconnect with Morgan before the end of the mid-season finale. I guess they’ll be starting up in February with Morgan’s story. Does anyone have ideas about the markings on the trees?